Abcam’s ICAM1 (CD54) in vitro SimpleStepELISA® (Enzyme-Linked Immunosorbent Assay) kit is designed for the quantitative measurement of ICAM-1 protein in Human cell culture supernatant, plasma, serum and cell lysate samples. ICAM1, is a cell surface glycoprotein typically expressed in endothelial cells and cells of the immune system. The extracellular portion of ICAM-1 forms five immunoglobulin like domains attached to a single hydrophobic transmembrane region and a short cytoplasmic tail. ICAM-1, binds to the Leukocyte Integrins LFA-1 (CD11a/CD18) and Mac-1 (CD11b/CD18) as well as to non integrin ligands such as CD43, fibrinogen, hyaluronan, Rhinoviruses and Plasmodium falciparum-infected erythrocytes. Binding to LFA-1 facilitates trans-endothelial leukocyte migration to areas of inflammation via promotion of endothelial apical cups assembly. ICAM-1 expression increases in the vascular endothelium, macrophages and lymphocytes in response to cytokine stimulation (IL-1 and TNF). Furthermore, ligation of ICAM-1 up-regulates its own expression in a positive-feedback loop to maintain a pro-inflammatory environment conducive to leukocytes endothelial transmigration. Soluble ICAM-1 is reported to be present in normal serum, cerebrospinal fluid, urine and bronchoalveolar lavage fluid. Elevated levels of soluble ICAM-1 have been associated with multiple organ failure, atherosclerosis, autoimmune disorders, diabetes, obesity, hypertension, liver disease as well as cancer, and several studies have correlated serum levels of sICAM-1 with the severity of these diseases. ICAM1 is a 85-110 kDa single chain type 1 integral membrane glycoprotein with an extracellular domain of five immunoglobulin superfamily repeats, a transmembrane region and a cytoplasmic domain. It shares considerable amino acid sequence homology with ICAM3 and with ICAM2. ICAM1 is expressed by activated endothelial cells. It is detected on cells of many other lineages (e.g. epithelial cells, fibroblasts, chondrocytes, B lymphocytes, T lymphocytes (low), monocytes, macrophages, dendritic cells and neutrophils), with lower levels that increase in inflammation. ICAM1 is also detected in some carcinoma and melanoma cells. Soluble ICAM1 is detectable in the plasma and is elevated in patients with various inflammatory syndromes. It is the receptor for rhinoviruses and malaria. Our Abpromise guarantee covers the use of ab174445 in the following tested applications. Example of ICAM-1 dynamic range in Raji cell lysates. The curve was prepared by loading 5 µg/mL of Raji cell extracts, followed by a 1:2 titration series. Background-subtracted data values (mean +/- SD) are graphed. Specificity of ICAM-1 signal on stimulated and non stimulated media supernatants. Human PBMCs were cultured in RPMI supplemented with 10% fetal calf serum, 2 mM L-glutamine, 100 U/mL penicillin, and 100 µg/mL streptomycin. 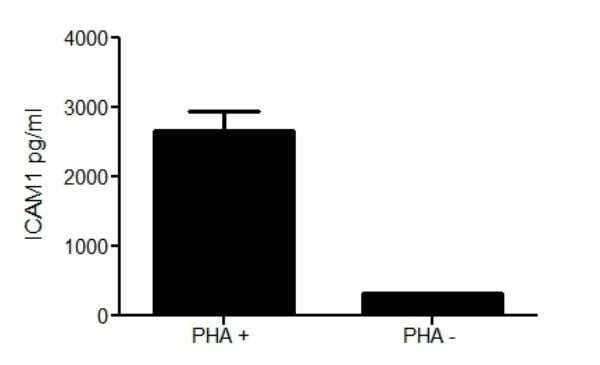 Cells were cultured for 2 days at 37⁰C in the presence or absence of PHA. The concentrations of ICAM-1 were interpolated from the calibration curve and corrected for sample dilution. 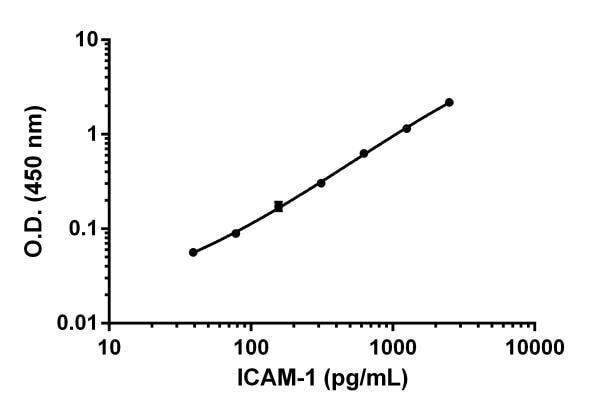 The mean ICAM-1 concentration was determined to be 320 pg/mL in unstimulated PBMC supernatants and 2,654 pg/mL in stimulated PBMC supernatants. Frequency histogram of ICAM-1 levels in serum of individual normal healthy donors. The levels of ICAM-1 in serum samples were tested from ten individual healthy donors. Levels were interpolated from the standard curve and corrected for sample dilution. The levels of ICAM-1 are shown for the percentage of individuals within each 100 ng/mL bin center of the distribution. The mean level of ICAM-1 was 469 ng/mL with a range of 347 to 629 ng/mL and a standard deviation of 77 ng/mL. 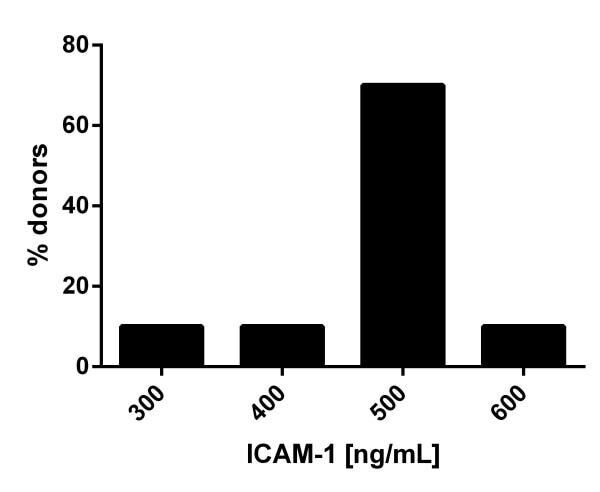 Comparison of ICAM-1 levels in three Human cell culture lysates. The levels of ICAM-1 protein were assessed in three Human cell line lysates loaded at 2.5 µg/mL of protein. The raw OD 450 nm signal for each sample was interpolated from an ICAM1 standard curve. Publishing research using ab174445? Please let us know so that we can cite the reference in this datasheet. There are currently no Customer reviews or Questions for ab174445.